Last week's active weather across the United States gave way to much drier and warmer conditions nearly nationwide this weekend. Highs Sunday climbed to triple digit readings across south central Kansas. The high of 102 in Wichita, KS was the earliest date on record for the city breaking 100 degrees. Temperatures weren't quite as hot across northeast Colorado on Sunday, but still mighty warm. Denver International Airport topped out at 85 degrees, just three degrees short of the record high for the date. Downtown many thermometers were in the upper 80s Sunday afternoon, with a few even breaking the 90 degree mark. We'll be warm again today, but likely several degrees cooler than yesterday across the region. MOS guidance has temperatures back in the mid 80s for the urban corridor, but I think many places will manage to stay in the lower 80s. Warm temperatures stick with us through Tuesday before another system begins working its way into the region Wednesday. 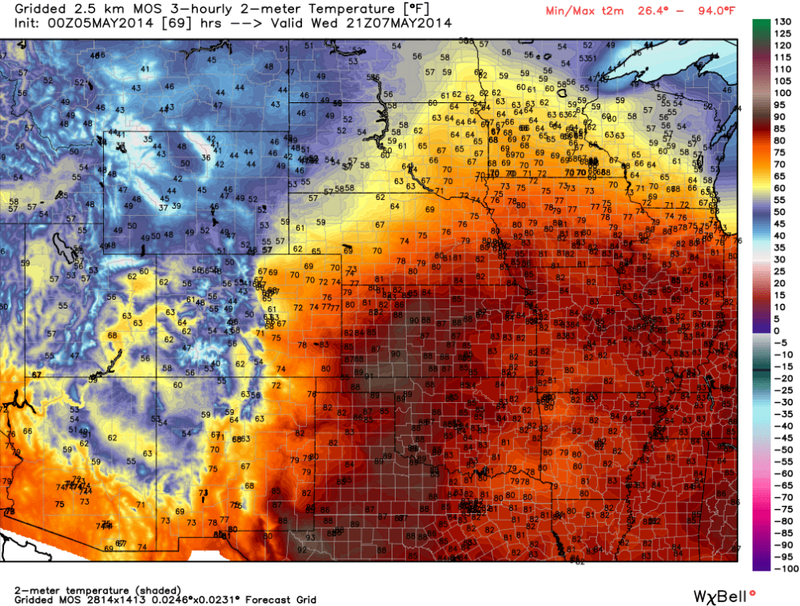 Below (left) are gridded MOS temperatures for early this afternoon, while the second image (right) is for the same time Wednesday. 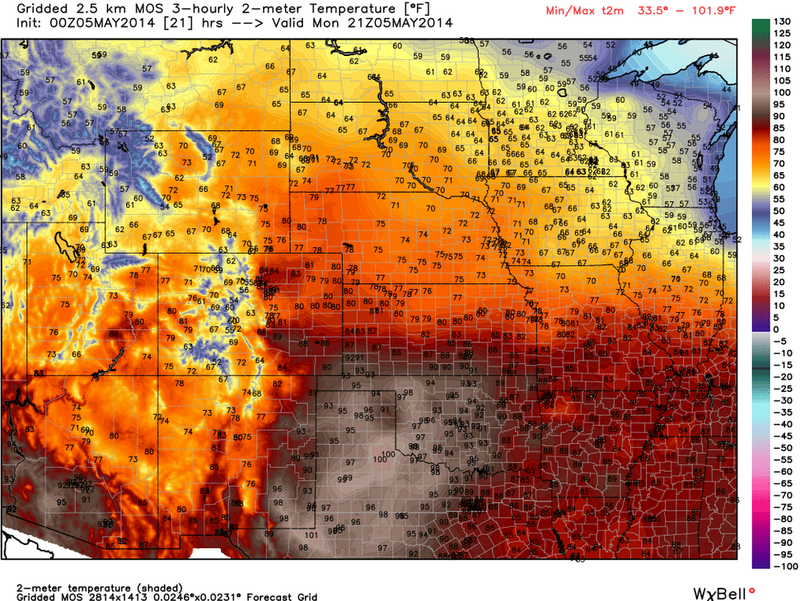 Notice the pool of cooler air working into the intermountain west. This cooling is part of another large trough that will be digging into the west Tuesday then pushing east Wednesday. Like last week this means a few days of unsettled and cooler weather for eastern Colorado, and again like last week, some will see rain and others won't. It looks like this system will favor northern Colorado moisture-wise, there's actually pretty good agreement there. The EURO brings the core of heaviest precipitation furthest south when compared to the GFS and Canadian, but still keeps most of the heaviest moisture north of Denver through the end of the week. While deep, most models agree that this system doesn't close off at the upper levels like last week -- at least not until it spins northeast of Colorado. At the surface the low is forecast to track across central Colorado, then work into northeast Colorado. The EURO has the track of the surface low about 50 miles south of where the GFS/Canadian takes it which accounts for higher precip totals across northeast Colorado for that model. In any case -- I looks like areas south of I-70 will have the lowest chance for precip this week across the eastern plains. We'll need to keep an eye to the sky Wednesday afternoon as some storms may become strong over eastern Colorado, especially in the very northeast corner of the state. There's not a ton of support for severe storms in Colorado -- the best chance for those will be east and northeast of the area (below), but as the trough moves over the state Wednesday expect a decent amount of instability across northeast Colorado and the chance for storms. Temperatures behind the front will drop below normal for Thursday. Widespread highs in the 50s will be possible for northeast Colorado, with scattered showers continuing into Thursday night. Temperatures rebound nicely by Friday and for the weekend, but we'll keep a slight chance for showers and storms going through Sunday.